Profiled here at Vanishing Montreal last September the very narrow apartment building in St-Henri, on the corner of St-Jacques and St-Philippe, is currently being renovated. This photo were taken in October and I passed by there last week and the renovations were still on-going. 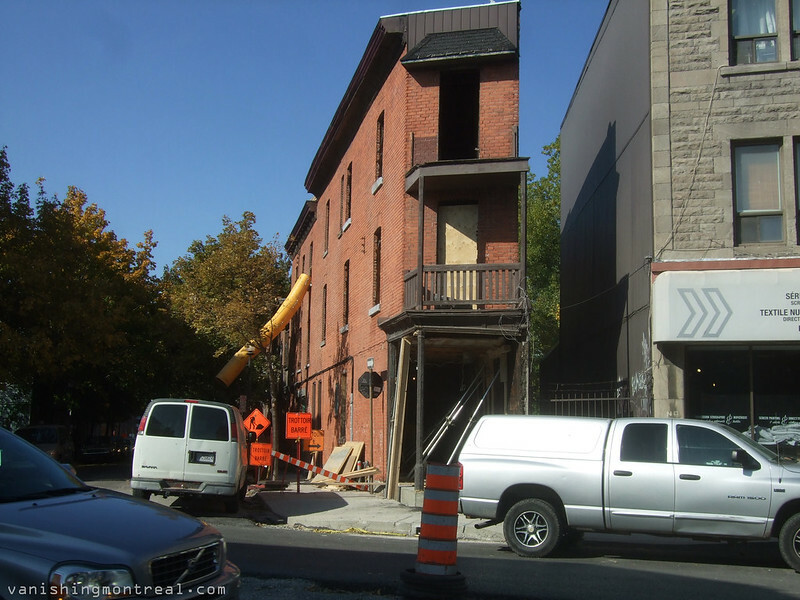 Profilé ici a Vanishing Montréal septembre dernier, les appartements très étroits à St-Henri, à l'angle de St-Jacques et St-Philippe, est en cours de rénovation. Cette photo a été prise en Octobre et j'ai passaé par là la semaine dernière et les rénovations étaient toujours en cours. OK so now I see how this functions! I live on this street - a corner away, actually. This street is tree-lined and two trees have been chopped down for the construction. Garbage litters the sidewalk and street. No respect for the neighbors. In essence - the people working here are yahoos.